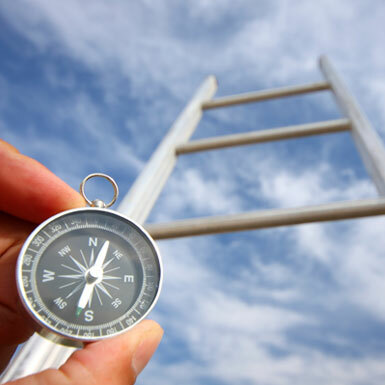 Huffington Post: For Leadership, Do You Need a Ladder or Compass? On your leadership journey, should you take a ladder or a compass? When I graduated from college, I had the naive notion that my leadership journey was a straight line to the top. Keep climbing the rungs of the ladder and eventually I would reach my destination. The idea of a career ladder places tremendous pressure on leaders to keep climbing ever higher. Instead, Facebook COO Sheryl Sandberg, favors the idea of a career “jungle gym” where you can move up, down or across. Adds eBay CEO John Donahoe, “Leadership is a journey, not a destination. It is a marathon, not a sprint.” On your winding journey, you need a compass to stay focused on your True North, not a ladder whose rungs you climb. In my early years, I was hardly recognized as a leader by my peers. I was eager – too eager – to get ahead. In high school and college, I lost seven consecutive elections. There was a simple reason for this. I was so ambitious and centered on myself that I never took the time to develop close relationships. Then a group of seniors at Georgia Tech gave me some sound advice. “Bill, you seem more interested in getting ahead than in helping other people. No wonder no one wants to follow your lead.” Devastated by this feedback, I took their advice to heart and came to grips with my shortcomings, focusing on others instead of myself. As a result, I was selected to lead many organizations. Years later, I got caught again in my own trap. In the late 1980s, I was on my way to the top of Honeywell. As executive vice president responsible for nine divisions and 18,000 people, I was one of two leading candidates to become CEO. Driving home one day, I looked in the rear view mirror and saw a miserable person – me. On the surface, I appeared to be energized and confident, but inside I was deeply unhappy. In that instant I realized I was more focused on climbing the corporate ladder than being a values-centered leader who makes a difference in the world. I faced the reality that Honeywell was changing me more than I was changing it–and didn’t like the changes I saw. When I awoke to my reality, I reopened the opportunity to join Medtronic that I had turned down three times before. This decision led to the best thirteen years of my professional life. Had I not had that awakening at Honeywell, I might never have seen Medtronic’s possibilities. In researching my new book, Discover Your True North, we interviewed 170 authentic leaders, from Oprah Winfrey to Howard Schultz. All of them followed difficult paths to success and authenticity, yet stayed grounded by building on their life stories. By understanding their formative experiences, they reframed their stories and shaped their leadership around following their True North. Phase I is “Preparing for Leadership,” where leaders develop through education, extracurricular experiences, and early professional work. This is the period where character forms and people lead for the first time. In Phase I most people are naturally self-absorbed, as measures of success are based primarily on individual accomplishments. The basis of authenticity, however, lies in the values they develop in these early years. 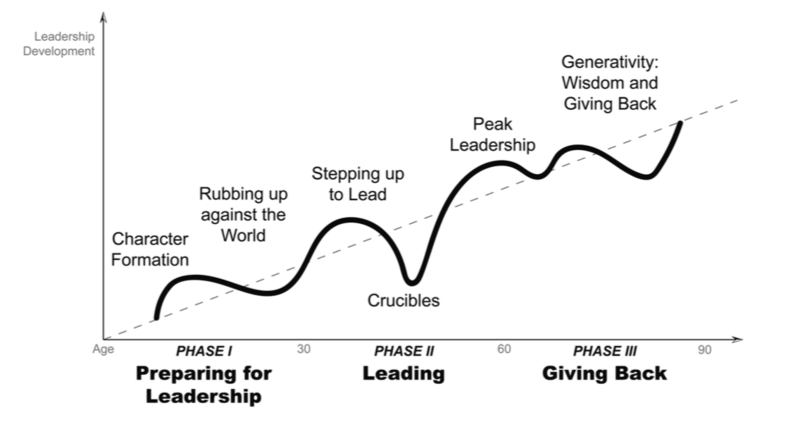 Phase II, “Leading,” begins as individuals take responsibility for leading others and transition from “I to We,” culminating in their peak leadership experience. As they take on greater responsibilities, most leaders have setbacks that test them to their core: their sense of self, their values, and their career assumptions. Through these crucible experiences, leaders learn who they are at their essence and prepare themselves for greater challenges ahead. Phase III is “Generativity,” wherein leaders focus on giving back by sharing their knowledge and wisdom with many people and organizations. These days, many leaders are foregoing conventional retirement to share their leadership experiences with others, serving on boards, mentoring young leaders, or teaching and writing. Psychologist Erik Erikson describes the choice in this phase: generativity versus stagnation. For leaders who focus on helping others, this stage is filled with meaning. Those who don’t often face the stagnation common with old age. Regardless of where you are in your journey–just getting started, looking for new challenges, or nearing the top–each leadership experience provides myriad opportunities for personal growth and to discover your True North. If you embrace your life story and learn from its lessons, your leadership journey leads to great satisfaction and fulfillment. This article was originally posted 8/17/15 on the Huffington Post as part of a series on True North Leadership.